"I bid you good night." In the hopeful longing for even a flavour of cinematic truth, I have something of a fascination for wartime stories, particularly those involving life under occupation, something my generation have never experienced and know only through the stories of our elders. As time distances us further from the event, at least as it affects those we may have known or been related to, the truth is in danger of being usurped by the movie version, which for the purposes of drama usually involves an over-simplification of situation and character. That generational distance makes it doubtful that many of today's more aggressive ambassadors of youth could even conceive of the idea of having to watch every word they said or look they gave for fear of potentially fatal recrimination against themselves and their family. Somehow I don't think "Don't you tell me what to do!" would have got you very far in Nazi-occupied France. It's that movie favourite of rooting for the underdog as they do battle with the evil oppressor that I'm sure makes so many of us believe that if we'd been in France during the dark days of WW2 then we'd have joined the Resistance in a flash and would have given those invaders what for at every opportunity. We'd like to think that because our sense of justice demands that we on some level fight for what we believe in and oppose injustice at every turn. But we weren't there and most of us have never been in an even remotely similar situation, one that we had to live with every day with no assurance that it will ever come to an end. Such bravado is misplaced, as true empathy and understanding is simply beyond us. Resistance comes in many forms, from direct action – that famed grey area in which terrorist and freedom fighter are separated only by semantics – to simple non-cooperation. Both methods have their passionate supporters and stern critics, the Violence Solves Nothing debate up against the charge that passive resistance is only a step away from reluctant collaboration. But in a situation controlled by absolute power, even the smallest protest has its potentially serious consequences. The setup of Le Silence de la mer is deceivingly simple. In 1941, during the German occupation of France, German officer Werner von Ebrennac is billeted with an old man and his niece. The pair are hostile to the arrangement and deeply resentful of this invasion of their property and elect not to communicate with Ebrennac or even acknowledge his presence. But Ebrennac is not the unfeeling Nazi they have presumably been expecting, but a polite, intelligent and cultured man with a passion for France and its culture. Every evening he joins his reluctant hosts and talks to them enthusiastically about his music and art and literature, about his life and homeland and his love of their country. The old man smokes his pipe and reads, his niece sits and sews – both hear his words but neither speak nor react to him in any way. Locational diversions aside, this is how the bulk of the film plays, with Ebrennac addressing a determinedly unresponsive audience. And yet he never gives up, never becomes discouraged. On the contrary, he even expresses admiration for their stance, for their love of their country. With the action initially restricted to one location and three characters, and the conversation to a series of monologues to which there is no direct response, you could be forgiven for suspecting the film has stage play origins, were it not for the enigmatic opening that firmly establishes the identity of the source novel and its Resistance associations. It certainly has the intrigue of good stage drama, not least in Ebrennac's initially uncertain motivations. Is he a genuine Francophile convinced that he can eventually break down the wall between them, a lonely man in search for communication and debate, or an insecure oppressor desperate to convince the downtrodden of his inner humanity? Or is he simply a self-deluded megalomaniac who simply loves the sound of his own voice? Our conviction of his sincerity grows with that of his unwilling audience, his presence in France revealed to be as much a result of naivité – he repeatedly expresses the view that Germany and France will be united in "a beautiful marriage" – as the desire to embrace a culture he has for so long admired fro afar. The foundation may be theatrical but the presentation is richly cinematic, the use of expressive camera angles, lighting and mise-en-scène taking their cue as much from German Expressionism as from Hollywood noir cinema. The visualisation of Ebrennac's stories and memories, occasional at first but building to in an extended and fateful visit to Paris, are a winning blend of documentary realism (the uniformed Ebrennac's exploration of the city's landmarks can't have been an easy shoot just two years after the end of the war) and more carefully staged sequences in which Ebrennac recalls significant incidents from his past or meets with his colleagues at an officers' club in Paris. 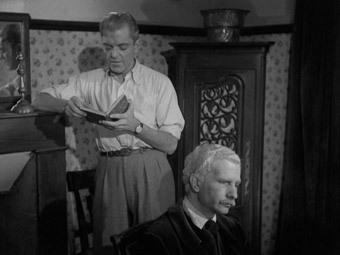 Camera movement and framing are used to powerfully augment the dialogue or drama, such as the slow dolly in to a portrait of Hitler during a discussion on the Treblinka extermination camp, or the chance meeting of Ebrennac and the old man in the offices of the occupying forces, faces caught in a mirror framed by images of the German occupation. Within this framework the occupants of the house start to undergo subtle but telling changes. The uncle begins to listen to words he remains outwardly unresponsive to, while he expresses in voice-over a surprising disquiet at Ebrennac's temporary absence. His grudging but gradually evolving respect for the man also causes him to doubt the righteousness of his silent stance, prompting him to remark that "it pains me to offend anyone, even if he is an enemy." 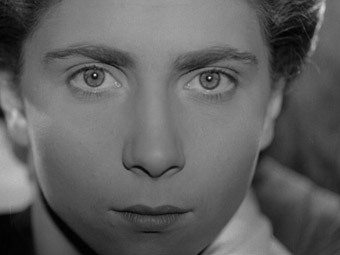 For his niece the developing emotional connection is more complex, and one she later clearly has to fight to keep hidden, its temporary escape caught in quiet but powerful close-up and represented by just a look to camera and her only audible word of dialogue. It's an extraordinary moment both for the story and for cinema, a reminder that film does not need to shout to exert emotional power, but speak in the right sort of whisper. The name of Jean-Pierre Melville should be a familiar one to all cult film fans, not least for because he was responsible for one of the greatest of all cult movies, 1967's Le Samourai. Director of just 13 features in his 30-year career, his work nonetheless had a considerable impact on later filmmakers, his 1956 Bob le Flambeur having an apparently inspirational effect on French Novelle Vague directors Jean Luc Godard and François Truffaut, while his body of work has been cited by the usual suspects of modern American indie cinema as a major influence. But the path to movie-making success was not an easy one for him. With no formal training and denied a technician's union card, Melville set up his own production company and for this first project chose to make a film of a respected novel without the author's consent, with a little known cast and a cameraman similarly new to feature films. Such was his confidence that he offered a deal to the book's famed author, Vercors, that if the finished film didn't meet with the approval of a jury of eminent former Resistance members then he'd destroy it. His boldness paid off, and he was even able to use Vercors' house as his principal location, the very building in which the original story was written. For a first feature, Le Silence de la mer is astonishing in its confidence and understanding of cinema, something Melville learned through the appreciation of the work of others, a trait more usually associated with the so-called film generation of 1970s Hollywood. What begins as a cautious plea for communication in the face of adversity develops into a powerful and moving condemnation of the perils of wish-fulfilling political naiveté. 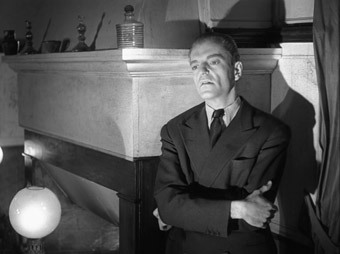 Featuring at its centre a fine central performance by Howard Vernon in a difficult role as Werner Von Ebrennac, Le Silence de la mer fully deserves its reputation as one of the finest of all post-war Resistance films. Dramatically and cinematically compelling, its message of rebellion in the face of overwhelming odds remains potent and relevant to the politics of today, not least in the quote the old man leaves for Ebrennac to read and consider: "It is a fine thing when a soldier disobeys criminal orders." Framed in its original ration of 1.33:1, the transfer has clearly been made from a less than pristine original, with dust, scratches and moisture damage all in evidence, although digital restoration work has reduced much (though not all) of it to the degree where it is not distracting. In other respects the picture quality is impressive, with contrast and detail both very pleasing. The Dolby 2.0 mono soundtrack has an inevitably narrow dynamic range and a slight background hiss normal for films of this vintage. Some sudden shifts in tonal clarity, sometimes mid-sentence, suggest the restoration was made from more than one print. The booklets that accompany Masters of Cinema releases are always handsomely produced and interesting to read, but this is one of their best yet, not so much for volume but the sheer quality of the content. Divided into two unequal halves, the first 34 pages are devoted to a sizeable extract from Ginette Vincendeau's above-mentioned book, a fascinating and information-packed read that will expand your appreciation of the film and should sell a few copies of the work it is taken from. Inevitably there's considerable crossover with the above interview. The final 17 pages comprise an interview with Melville in which the director discusses in delightful detail Le Silence de la mer with interviewer Rui Nogueira, translated into English by Tom Milne in 1971 for the BFI. Long out of print, this is a most welcome and enjoyable inclusion. A remarkable first feature whose production is a story in itself, Le Silence de la mer is so much more detailed and layered than its seemingly simple structure might suggest. A gripping and ultimately moving drama, its politics may be of its time but still has lessons for today, while its humanism should speak to any generation prepared to listen. The Masters of Cinema disc does as well as can be expected with the original material, and although short on extra features, that booklet counts for a lot. Recommended.